Is your horse showing signs of colic? 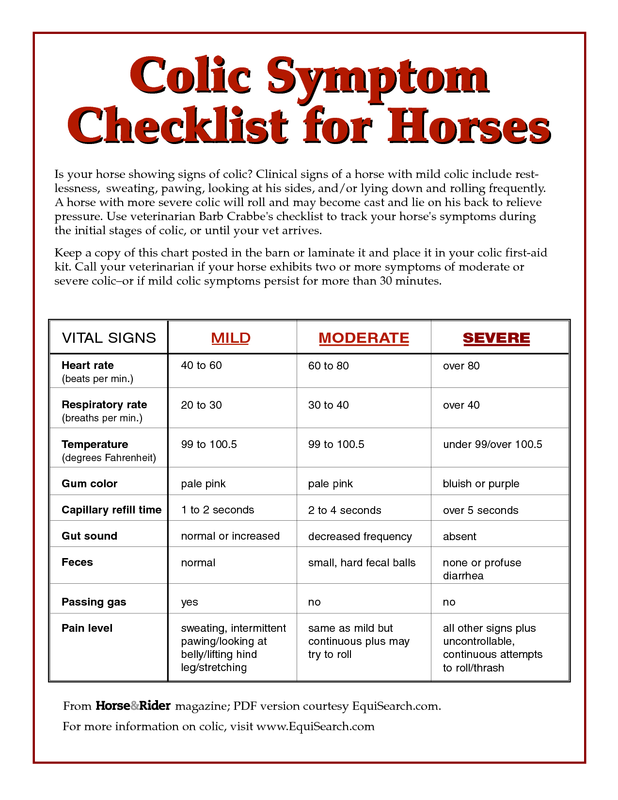 Use Veterinarian Barb Crabbe's colic checklist to track your horse's symptoms during the initial stages of colic, or until your vet arrives. Identifying the early stages of colic and knowing when to call your veterinarian can be vital to protect your horse&apos;s health. Keep a copy of this chart posted in the barn or laminate it and place it in your colic first-aid kit. Call your veterinarian if your horse exhibits two or more symptoms of moderate or severe colic--or if mild colic symptoms persist for more than 30 minutes. Download a copy of this chart to print here. For how to modify your management routine to slam the door on colic, see the article "Horse Care" in the July 2002 issue of Horse & Rider. Your foaling stall is all set up--draft-free, well bedded with straw, and dimly lit. Here are seven essential items to keep on hand for your after-foaling duties, plus guidelines on how to handle your mare's afterbirth.